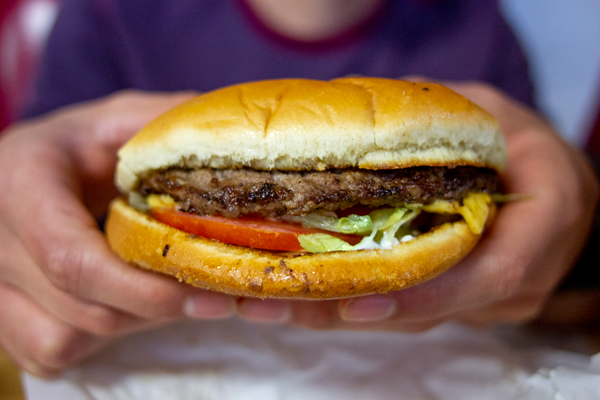 There are few things in life more precious than a great burger, and you are more likely to spot a unicorn than get a bite for less than $6. 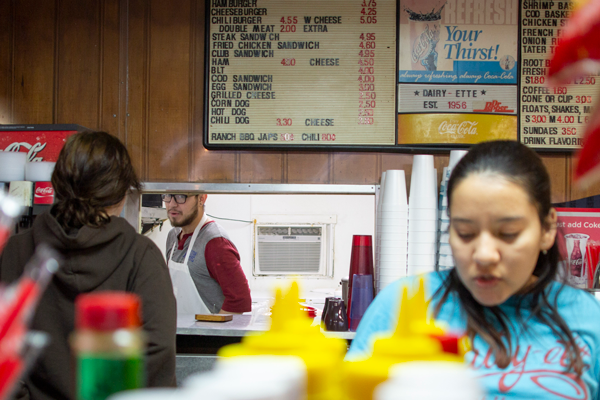 But at the Dairy-Ette in Dallas, all it takes is a four-minute drive from campus and $4 to sink your teeth into the best bite for your buck. Driving by the Dairy-Ette you would probably think it was abandoned, or you may miss it entirely. The outside is underwhelming, with nothing showy to invite you inside. It’s all old brick and chipped paint. Its signs are faded, and the parking lot is rough asphalt that has not been repaired in years. However, when you walk in, there’s some kind of magic there. The old-style dining booths look like they have been preserved from some movie made in the ‘50s. The counter, with its swivel stools, bring to mind a clean Waffle House. The gumball machines in the corner and the decorative Coca-Cola clock make the Dairy-Ette feel like your long-lost home. Unfortunately, aesthetics can’t feed me, so how good is the food? Their burgers are unphotogenic and, exactly like the exterior of the restaurant, kind of bland and bordering on sketchy. They sort of look like something you can make at home and maybe make the one at home look better. But the second you take a bite, you realize it’s worth so much more than the four bucks you dished out and you couldn’t do it this well in your own kitchen. The burger is simple, yet delicious. Its simplicity is paired with careful consideration. Everything is done right and it all works together to taste great. What makes it even better is when you wash it all down with a frosted mug of root beer, or even better, when you wash it down with their amazing homemade root beer floats. The Dairy-Ette was established in 1956 and since then has been a staple to the local community. “I started working here when I was at least 13 in 1994, my grandfather wanted something a little bit more stable and him and my uncle Rudy started this,” Bob Prikryl, owner of Dairy-Ette, said. Not only has it served as a family diner, like with Prikryl, it has also been the first job of many of the high schoolers of Bishop Lynch. Most everyone is on the hunt for the cutest little restaurant with an Instagram-ready meal, and little restaurants are popping up daily to provide that at an extravagant price. But, right here in the neighborhood, the Dairy-Ette is doing what it’s always done: prove that great food can cost less, come out of seemingly hidden places and be more authentic and better for it. I don’t know about you, but when money is tight, and finals roll around, I’ll be at the Dairy-Ette with a burger and root beer float for less than $10 eating away my stress.